Science isn’t Broken: Or is it? Much of the reaction to the article was overwhelming, well-deserved praise for an article which eloquently explains the difficulties in science and why answers are tough to find. However, my reaction can be summed up as close to following tweet, that is the headline purports that ‘Science is not broken‘, which seems to imply to me that no action needs to be taken. There are many things about the state of science, and how wider society as a whole interacts with it, which needs to be carefully considered and actions need to be taken to improve it. An article entitled “Science isn’t broken” does not inspire the necessary call to arms that is needed, even if it accurately describes precisely some problems science faces. For me, the real question about whether or not science is broken comes down to whether there are structural problems in the way we do our science? I will try to argue that there are. Much has been written previously on how science is funded and indeed it is a perennial issue. One such consistent commentator on this issue is Ben Goldacre and his fight for medical research through the #AllTrials campaign as well as articles and books. The problem is twofold: a shift towards viewing the funding of science as (purely) an investment and sources of government funding shrinking and so a higher proportion of funding coming from other areas. Science as an Investment, so what? The whim of landed gentry. Funded by quasi-cults (in which the wrong proof could lead to your untimely death). Directly funded to better a particular emperors warring. “the duty of erecting and maintaining certain public works and certain public institutions which it can never be for the interest of any individual, or small number of individuals, to erect and maintain; because the profit could never repay the expence to any individual or small number of individuals, though it may frequently do much more than repay it to a great society.” An Inquiry into the Nature and Causes of the Wealth of Nations, Adam Smith (1776). This thought was never universal, however, and science always maintained a delicate balance between very applied research and blue sky knowledge-for-knowledge’s sake research. In the 20th Century Industry began to recognise the benefits of sustained funding in R&D. It also saw two major world wars which directed government research funding around war-making once more, culminating in the nuclear bomb being designed and used a full 6-9 years before the nuclear power plant. With the war over the cold war began and the US, through a prominent report by the presidential science adviser, Vannevar Bush, science was seen as vital. In it he was able to convey the importance of basic research and the need for independence of inquiry. Funding through the cold war was very healthy: if only in an effort to compete with the Soviets. It seems, more recently governments have started to lose faith that basic research is a public, necessary good and that it will pay itself back. 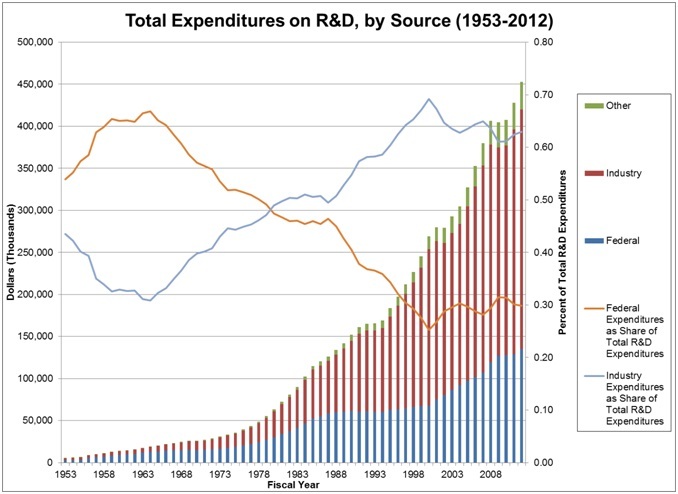 This can be seen reflected in the increasing proportion of research funding that stems from private businesses. The UK and US graphs show this phenomena is not something new. So what? Isn’t it a great thing that business recognise the vital role science plays? Yes and no. With private funding comes added challenges that need to be tackled head on. The original article discusses human bias in science and often we have seen that funding can add (conscious and unconscious) pressure on the scientists to get certain results, or not to publish when unfavourable results are found. The #AllTrials campaign (forcing all trials to be registered and published, including those with negative results) is one effort to correct this without losing the asset of private money. There is also a more subtle problem with having a high proportion of science funding coming from business and industry. That is a simple one, basic research is incredibly valuable down the road (Case Study: Quantum Physics and The Laser) but also notoriously difficult to predict or account for the impact it’s had on a timescale of interest to businesses (or indeed governments). In addition many of the long term interests of human progress lie outside of current business models and in some cases are a direct threat to the business model of whole industries: a good example of this is climate change and the oil industry. By matching private funds, insisting on clear open reporting of sources of funding and a rigorous peer review system 1 can help ensure bias is minimised. Alongside changes in how university research is funded there have also been significant changes in how they are run and managed. Research councils, faced with real term cuts to their budgets, started to have to think about making some rather uncomfortable choices about which research to fund and trying to squeeze out every drop of ‘value’ and ‘impact’ from the money they do spend. The key problem is that science is a creative process at the very edges of human knowledge. Some research has clear ‘pathways to impact’ but some does not. Indeed, some research will sit unconsidered and unused for a generation before revolutionising peoples everyday lives. Alongside this is a feeling that science (and wider society) will maximally thrive on competition. In turn, these considerations and reforms have pushed universities to be more competitive with each other and seen a rise in the use of performance targeting (especially harmful when the targets uses measures that are dubious). Universities are pressured to perform in yearly checks like the REF which in turn leads them to pressure their academics to focus on the type of research that ticks the right boxes (which may not be the best long-term for progress in science). Sometimes the pressures get so much they contribute to tragic incidents or decent staff leaving altogether. All these pressures are undoubtedly behind some of the ‘misdemeanors’ that occur in science listed above and other minor, well-known things: such as splitting one paper up into two or rushing to publishing ‘sub-standard’ research. The sad thing is all scientists would agree that we need to manage our scientists and ensure we get the most ‘bang for our buck’ (science has a long tradition of doing just that). However, using arbitrary measures and micromanaging scientists to get quick short-term gains is not what we need and it is leading to a workforce that is overworked, underpaid and with incredibly low motivation2. Much of this stems from the lengthy time the academic workforce are in ‘insecure’ employment. Across the pond, they use a system where ‘proven’ academics receive tenure: high security and academic freedom. There is much criticism (from both sides of the Atlantic) of the US tenure system which makes professors much more difficult to get rid of and it is often asserted that once tenure is achieved professors tend to ignore some of their duties (such as teaching). One thing in my mind, however, is clear, keeping employees in insecurity and putting high pressure on them is not the way to get the best from them. There must be a better way. Science communication (and problems with it) is incredibly complex: it involves the standard of science education, the media, the universities and their press offices and of course the scientists themselves. Leaving education aside and focusing on just two things that relate to this article’s narrative: press offices and the media. More competition between universities and higher pressure on individuals to show their research has impact and to stand out in a competitive job market, press offices and individuals have become more and more likely to present the research uncritically: that is to over-inflate its significance. This pressure tends to make press releases sound like the research is a game-changing, earth-shattering product of a once-in-a-generation genius, this in turn gets picked up by news outlets who end up printing headlines that contradict each other from week to week, this leads readers confused. It undermines trust in science, making it seem like it’s always changing and therefore anything might be true. As the original article tackles this is not representative of science which is often low-yield, negative results where the ‘right answer’ comes from compiling many studies and papers. Working out how, as scientists, to get this across to a media increasingly after simple ‘sound-bite’ statements that back up their world view remains an open problem. It seems to me that yes ‘Science is not broken‘ but that doesn’t mean it doesn’t need fixing. There are plenty of issues which require actions to ensure we are ‘stumbling toward the truth’ in the best possible way and indeed finding the truths that will help not hinder a sustainable, livable future for humanity and the only place in the universe confirmed to be able to sustain complex life. What science needs on all these issues more than anything else is open, honest discussion. So please join me on twitter to discuss these issues on #IsScienceBroken or if you are not on twitter or prefer anonymity please feel free to email me. Also worth noting is this is not intended as a complete list of all the challenges science faces, I tried to keep it snappy! Is the Government Burying the Facts on Climate Change ? Copyright © 2019 Progressive Science Institute. Powered by WordPress. Theme: Spacious by ThemeGrill.